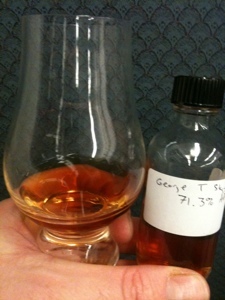 The Coopered Tot: George T. Stagg 2011 - The Titan. The King. "For the second year in a row, George T. Stagg, the iconic uncut, unfiltered bourbon released annually from Buffalo Trace Distillery, has been named the number one spirit in the world by noted spirits reviewer F. Paul Pacult"
Yes - Pacult considers George T. Stagg 2010 and 2011 to have been the finest spirits in the world - period. It made big news in 2010 when Highland Park 18, his top pick for over a decade, was finally unseated by *gasp* a Bourbon. This is a perfect selection for this, the 100th post on The Coopered Tot. We're celebrating with fireworks. "George T. Stagg was successful whiskey salesman who, in 1870, helped E.H. Taylor purchase a distillery originally built in 1812 by one Harrison Blanton. They named the distillery “O.F.C.” after its original name, “Old Fire Copper” and proceed to make a number of significant improvements until 1878 when Stagg bought out his partners share. The distillery was re-named the George T. Stagg distillery in 1904 and ultimately was re-named the Buffalo Trace Distillery in 1999." ... "Along with the strikingly high proof (142.6), another incredible stat about this whisky is the amount lost to evaporation over the years, nearly 58%. After maturing in new American Oak for 18 years and 5 months, the 2011 version was pulled from 124 barrels to make up arguably the most well-known and revered expression of the Buffalo Trace Antique Collection." So, it's the marquis product, incredibly old, enormously powerful, rare, and reputed to be the best spirit in the world. What a build-up. Color: Dark Reddish amber bronze. A fascinating and incredibly rich color. 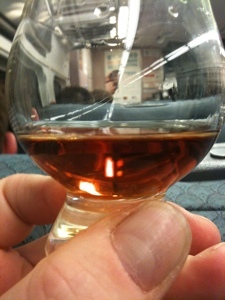 Nose: Dense dry leather, saffron, apricot. Old orange, canned peaches and cherry preserves. Virginia tobacco. Chrysanthemums, dried daisies, sultanas. Citrus flowers. A wild and wonderful nose with nobility, depth, and complexity. A few drops of water adds some hard candy and flowers to the dense apricot leather nose. It also adds some smoky, meaty notes. With those few drops of water, on the tongue the sweetness and mouth feel are enriched and oak forms a rich incense filigree. Char and smoke mingle with the oak incense and deep dried citrus cherry fruit leather. Huge. Titanic. Mouth filling. With extensive time (an hour) the entry evolves from fruits to brown sugar blackstrap molasses and the sandalwood box wood perfume grows in influence become exquisite and intense. The afterglow bears the flavors of having eaten red hots jujubes, and cherry pie. Dense. Layered. Evolving shades of sweet wood fruit and char. What a monster. What a stupefying tour de force of flavor density, august majesty, and complex and delicious flavor profile. It's clearly one of the greatest spirits ever. Who am I to disagree? My conversion is complete. I am 100% smitten. Yes, amazing, but rare and seasonal - Fall only. The 2011 edition is gone. You may be able to trade for it or find it at auction. I'll be gunning for it next year. It's quite hard to find in the NE. You have to scope out a liquor store angle in advance. The dynamics of evaporation where spirits in some areas of the world lose water and some lose alcohol are fascinating. Haven't heard anyone come up with a definitive explanation, it's just one of those mysteries of the world. Yes, mystifying. Humidity plays a role. In dry climates the water can be sucked out more than the alcohol - leading the proof to actually increase during aging (read Gavin's book on Canadian whisky. This seems to happen in Canadian whisky often because winter humidity is super low there). I have no idea how this stuff is still so strong after so much time. It's magic. 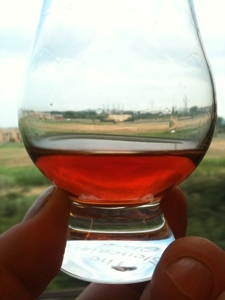 "..you have to keep in mind the fact that alcohol evaporates at a lower temperature than water. Secondly it’s worth mentioning that water molecules are much smaller than alcohol molecules. This means that in a barrel stored on a low floor of the warehouse, the temperature doesn’t usually rise to a point where water starts to evaporate, but it does get warm enough for some of the alcohol molecules to break free. Over time alcohol molecules work their way through the wood in the barrels and escape, so bit-by-bit the alcohol content of the Whiskey decreases. The opposite happens in barrels stored on the top floors. Here the temperature rises to the point where both alcohol and water start to evaporate, but as the water molecules are smaller, it is much easier for them to escape through the grain of the wood, which means that more water escapes than alcohol and so the strength of the Whiskey increases." Word of warning: PLEASE add water to this. According to Chuck Cowdery, you will damage your esophagus if you keep drinking spirits that are 50+ percent ABV. Of course George T Stagg is a bourbon I've never been able to find so congratulations to anyone that can find a bottle in California. Good point. I drank it straight - but only tiny sips and super slowly. Kiss it. It's so powerful and densely flavored that tiny sips fill your mouth. With water and time this stuff is only improved. I added only several drops. It was probably still over 120 proof - but into the realm of reason. I tend to drink my whisky quite strong. I acknowledge that this can mask flavors sometimes. There is some evidence of increased rates of esophageal cancer from consumption of certain spirits, but it seems to be related to acetaldehyde concentration, which should be low if cuts were made well. Anything that's commercially available should be safe as long as you're sipping and not not doing shots. Luckey me i ahve about 12 bottles in stock various years 2007 to 2011. No 2012 yet, can't find even one bottle. Lucky you indeed! I can't find a bottle of 2012 either. Best of luck to both of us on that score. In the meantime, enjoy the ones you've got! Which years are your favorites?